In 2018, 20 most expensive lots showed a healthy market that continued to churn out new records for major artists, despite many top lots selling on just a few bids or less. Collectors fought over paintings, furniture, and ephemera from the collection of Peggy and David #Rockefeller, which racked up $832.6 million in sales—the most for an #estate in #history. #Asian collectors continued to muscle their way into the top echelon of the auction #world, both by securing major works at sales in New York and by buying big lots during sales in #HongKong and #Beijing. 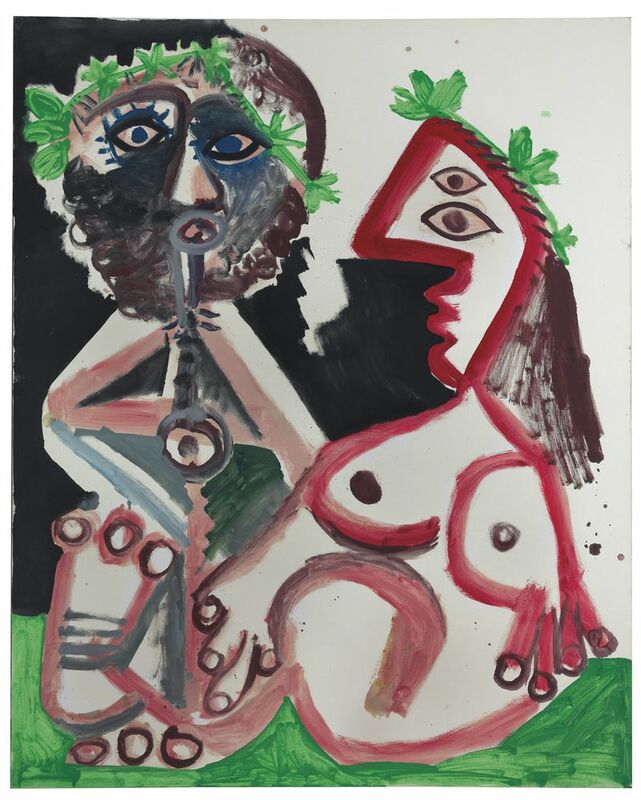 Picasso’s influence and contribution to the history of #20th-century art is undeniable. The exhibition uses several premises to support the idea that Picasso never ceased to be interested in the origins and traditions of painting, in much the same way as his migrancy bound him emotionally to his homeland, never shedding his loyalty to his cultural ties: #Málaga, #Andalusia and #Spain were all part of his “southernness”, and not just in artistic terms. DIEGO Voci, an #artist who also thrived in the “South“; #Andalusia region and connected deeply with the people. Helga Voci (widow of DIEGO Voci (VOH-chee) shares in writing from her #memories….“So we decided to go to Spain in October 1961. We took the car and went southward, stopped in several cities and after about 1 month we arrived in the Andalusia region in a very beautiful little fishing village called #Almunecar. This was an artist`s colony, all kind of artists from different countries. At least the Amazonen existed in Diego’s dream which he transferred to this canvas “Die Amazonen”. The ancient parchment illustrated is only the second known tribute to the Amazon warrior woman by internationally collected artist Antonio Diego Voci (1920-1985). Help us find this one. *Sold to him on his 1973 trip to #Colorado by Marsha Largent Piper, daughter of Dr. Ogden Brown, who was Diego’s exclusive USA representative. WHY #PICASSO IS MOWING THE LAWN IN #BROOKLYN? PICASSO! GAUGUIN! WAS BUYER OVERCHARGED? YOU, YES YOU ARE THE JURY!! A Russian Oligarch bought 2 Billion dollars of artworks including Klimt, Picasso, Gauguin, Rothko, da Vinci and more. He is claiming in court he was overcharged! One of the art pieces he bought was just sold for over $400 million! #ARTISTS THAT #PAINT THE SAME #SUBJECT IN VARIED MULTIPLE PAINTINGS! #DIEGO (Antonio Diego Voci 1920-1985) was one of them! Here are two examples (above) of a similar landscape where Diego captured a similar feeling and essence in these two works. When artists #GeorgeBraque, #Picasso, and #JuanGris created #cubistic #paintings it was often difficult even to the trained eye to identify which artist did the work. When Antonio #DIEGO Voci ventured into his cubistic mode he strived to be distinctively DIEGO. “Ink on Paper” is an important example historically because it was one of the very last works before DIEGO transitioned 3 days later. DIEGO drew this especially for what became his last exhibition, an open house at his residence the first week of December 1985. DIEGO remained upstairs in bed, too ill to personally attend. “DIEGO is an #artist. He looks like an #artist. For DIEGO there are no tomorrows, no yesterdays, only the moment. Now is important. Enjoy. To limit DIEGO to a “single style” is to #cage the #Lion. He can paint anything and he often does, yet there remains a strong vein, a unity and consistency in his divergent moods. #Pastel, #oil, #glass paint, #surrealism to #super-realism have all experienced the DIEGO technique – but mostly DIEGO is #people! DIEGO #loves #people. Truly loves. People are his #life and his #work. The people on his #canvas feel. They have experienced. They have lived. They are people for which one feels compassion. DIEGO needs canvas as well as people. DIEGO’s first few lines are #magical. Composition comes easy. So easy. Watching DIEGO in concert with paint makes one think tying shoes would be more difficult. Such ease. Such depth. Such strength.